Villa Cortijo Las Salinas is in the rural heart of Andalucia in Southern Spain, amidst a land of olive trees, deep blue skies and white washed villages. You can find Villa Cortijo Las Salinas sitting proudly and majestically in range of low green mountains on the edge of a natural park, where you have uninterrupted views over the beautiful and dramatic landscapes. Here you are surrounded by the beauty and charm of the local area, peppered with hints of the legacy of the moors, flamenco music, continual and incomparable fiestas, brilliant sunshine and the people of Andalucía who live life to the full. The access track has been in existence since the Romans. It is not difficult to imagine yourself thrown back more than 500 years as you pass over the narrow open sided Roman bridge and pass the huge agaves, a plant from which they make Agave Syrup and Tequila. As you pass under the bell hanging in the impressive entrance arch, gaze at the large swimming pool which appears to fall off into the olive groves and into the valley below, and enter the stunningly beautiful courtyard you realise you have arrived at a very beautiful and tranquil place. Follow directions using the Google Maps application on this page. This will take you to a bus shelter at the entrance to our track on the JA 4305. 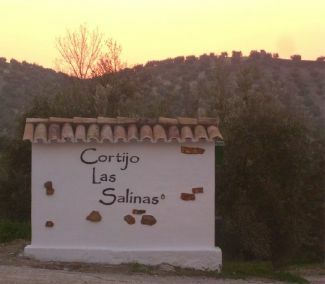 Here you will find a sign to Cortijo Las Salinas as shown below. Turn down the track to the right of this sign which will lead you to the Cortijo. The track is 2 kilometers long and you will pass on your left three small cottages on the way. Enter the following coordinates in your sat nav to arrive at the entrance to the track at the road, from here turn down the track to the right of this sign which will lead you to the Cortijo. The track is 2 kilometers long and you will pass on your left three small cottages on the way. These are printable if you just print the page from your browser. If you are having problems using it please feel free to email or telephone us and we will guide you through the process. We can also email you directions from your departure location or step by step directions from Málaga airport.